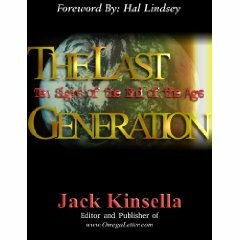 Jack Kinsella was the former head writer for the television program "This Week In Bible Prophecy" before joining Hal Lindsey Ministries in 1994. Jack is the author of more than three dozen video documentaries, including "Peace In Our Time" (TWIBP), "Front Row Seats" (TWIBP),  Mark of the Beast (TWIBP)  and "Left Behind" (TWIBP)  and of "1998 - Countdown To Armageddon" (International Intelligence Briefing-TBN), "1948, the Year The End Began", "Jerusalem, The Final Battle" and "The Late Great 20th Century", Where is America in Prophecy?". Jack was also editor of "This Week In Bible Prophecy" Magazine and a contributing editor to the print version of The Omega Letter and the Christian World Report. Jack has served as managing editor of Countdown Magazine and senior editor of the monthly newsletter, International Intelligence Briefing from 1994 until both publications were replaced by Hal Lindsey's Last Days Chronicles. Jack serves as senior editor of that publication as well as Managing Editor of Hal Lindsey Oracle website and newsletter. He has also collaborated in the writing of several books on Bible prophecy, including Hal Lindsey's Vanished.